Fairwind Shores holiday rental condo 105 B is a beautifully furnished and decorated first floor vacation rental unit. Fairwind Shores Condo rental features underground parking, tennis and a gorgeous pool area. Unit 105 B has updated kitchen appliances, wood floors, utility room with a washer and dryer and a nice patio with access from the master bedroom and the living room. The kitchen features a built-in microwave, smooth top range, water and ice through the refrigerator door, a pass through to the dining area and a built-in wine rack. Enjoy your morning coffee by the kitchen window. This spacious end vacation rental unit also features a window in the kitchen and living room. The master suite has 2 large closets, a dressing area with sink and vanity and a queen bed and TV. The second bedroom has a queen bed. Both bedrooms have ceiling fans. 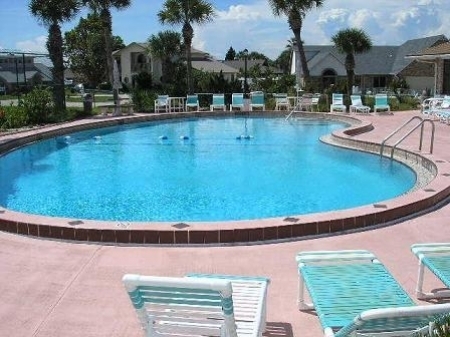 Fairwind Shores vacation rental unit 105 B is well equipped with everything you need to enjoy your vacation in beautiful Ormond by the Sea. Sorry, no pets and smoking is not permitted in this vacation rental units or in the building. Vacation rentals, seasonal rentals and longer holiday rental condo are available in this highly sought after building. Monthly minimum rentals only please. 2. The reservation deposit is not refundable for cancellations within 30 days of your scheduled arrival date. 3. Reservation deposits are held as a security deposit and not applied to the rental amount. 4. All payments must be made in full 30 days prior to scheduled arrival. 5. Cancellations within 30 days of scheduled arrival will not receive a refund unless the unit reserved is re-rented for the time period reserved. An administration fee of 20% will be deducted from the refund. 6. Your signature is required prior to arrival on a statement agreeing to our rental policies and any applicable condo rules & regulations. Access to the property cannot be provided without this signature. 7. $25 administration fee must be paid to change any confirmed reservation. 8. No refunds for early departures. 9. The cost of repair or replacement for any damages, phone charges, and items missing from the property will be deducted from the security deposit or otherwise collected from the tenant as provided by Florida statute. 10. Many of our properties cannot accommodate trucks, tractors, trailers & other oversized vehicles. Approval for any vehicle other than a passenger automobile must be obtained in writing in advance of arrival. 11. No Check - Ins after 3 PM unless arranged prior to arrival. Guaranteed late arrival fee of $25.00 applies. 12. Check in time is 3 PM. Earlier check in on your scheduled arrival date may be permitted, if the property is ready. 13. Check out time is 10 AM. 14. Maximum occupancy is 6 persons for a 2 bedroom unit,8 persons for a 3 bedroom unit. 15. Pets are never allowed in condominium rental units. 16. Reservations for specific units or floor ocations cann ot be guaranteed. We will do our best to accommodate requests, but we must reserve the right to re-assign units. 17. All reservations are confirmed on first come, first serve basis. 18. Monthly rentals that begin the first day of the month must depart the last day of that month. 19. Ocean Shore Blvd. is located between many of the condominium buildings and the Atlantic Ocean. This will not be an acceptable reason for cancellation or refunds. 20. Lockout charge of $50 unless during office hours. 21. Late arrival is not an acceptable reason for cancellation, refunds, or changes to scheduled departure. 22. Minor maintenance items or requests that are usually $5.00 or less (i.e. light bulbs, a/c filters, etc.) are the responsibilities of the tenant. 23. Subletting is not permitted. 25. Rates are subject to change without notice. 26. Must be 25 years of age to make reservations. 27. No refunds will be given for equipment, appliances, or utility failures. We cannot guarantee the appliances equipment, and utilities. We will make every effort to repair any failures as soon as possible but no refunds. 28. $50 fee if all keys are not returned to Ocean View Condominium Rental Group, Inc.
29. All payments are deposited in an interest-bearing account with all interest to accrue to Ocean View.